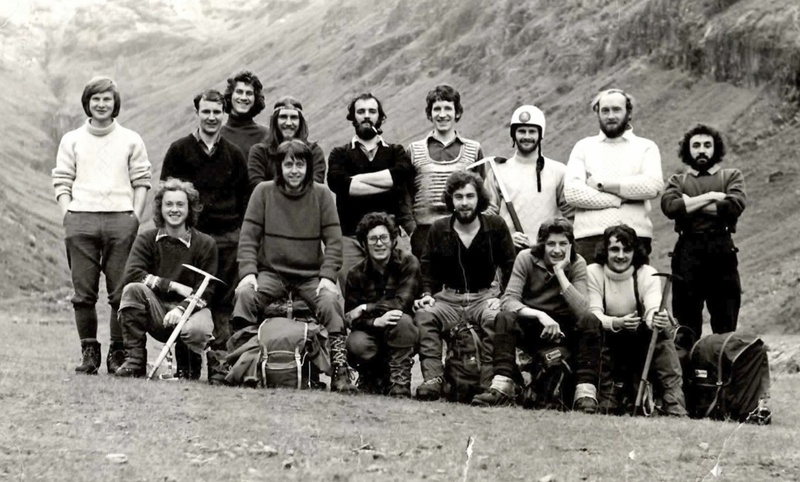 I WONDER if anyone recognises themselves in this old photograph of the Lomond Mountaineering Club. It was taken on a day out in Glen Coe in about 1975. Some had been hillwalking, others had been climbing on the East Face of Aonach Dubh. I’m the rather gormless looking one with the pipe hanging from my jaw – in the middle of the back row. The long-haired, cocky looking bugger second from left on the front row is my old mate Hamish Telfer. The guy with the bandana round his head is George Christie and the guy to my left is an old school pal called Raymond Stokes. The guy with the ice axe and climbing helmet in the back row was called Eddie. Other than that I can’t remember anyone else. Anyone recognise themselves – or their dad? Or even their Grandad? This entry was posted in Uncategorized by cameronmcneish. Bookmark the permalink. Front row: Phillip Schrieber, Hamish Telfer, Willie Johnstone, Dave McDonald, Brian Johnstone, Peter(?). Quite a few stalwarts are missing from the shot, including Bill Lindsay – the then secretary, Ken Johnstone, and Tommy Hardy. Your right, it was indeed a great club. Unfortunately, if I remember correctly, some good guys left to join the JMCS. Eric, A name from my past and great to hear from you. That photograph has certainly been in circulation for a long time and is a great moment in time. Climbing before the days of Gore-Tex, plastic boots and mobile phones! Those were the days. What?? You mean you’ve given up wearing itchy, hairy, tweedy, 19th century breeches? Shame on you!